Viscount Torrington. Ds. Willoughby Par. E. of Sandwich takes his Seat. John Earl of Sandwich sat first in Parliament, after the Death of his Grandfather Earl of Sandwich; having, at the Table, taken the Oaths, and made and subscribed the Declaration, and also taken and subscribed the Oath of Abjuration, pursuant to the Statutes. 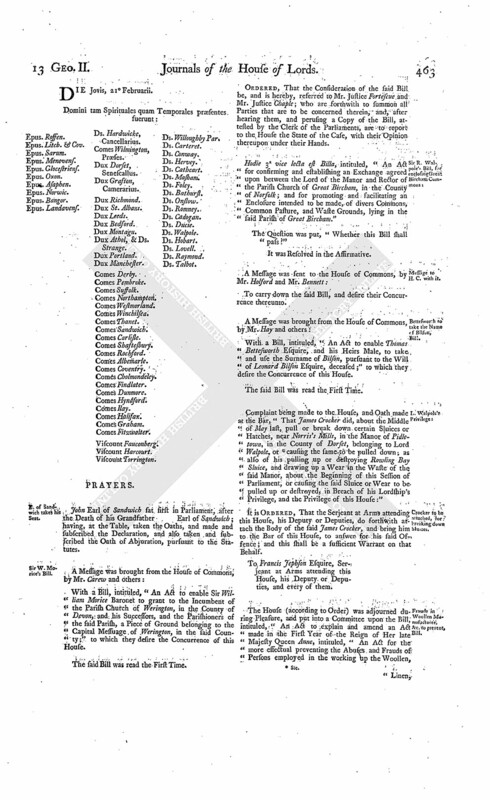 With a Bill, intituled, "An Act to enable Sir William Morice Baronet to grant to the Incumbent of the Parish Church of Werington, in the County of Devon, and his Successors, and the Parishioners of the said Parish, a Piece of Ground belonging to the Capital Messuage of Werington, in the said County;" to which they desire the Concurrence of this House. Ordered, That the Consideration of the said Bill be, and is hereby, referred to Mr. Justice Fortescue and Mr. Justice Chaple; who are forthwith to summon all Parties that are to be concerned therein, and, after hearing them, and perusing a Copy of the Bill, attested by the Clerk of the Parliaments, are to report to the House the State of the Case, with their Opinion thereupon under their Hands. Hodie 3a vice lecta est Billa, intituled, "An Act for confirming and establishing an Exchange agreed upon between the Lord of the Manor and Rector of the Parish Church of Great Bircham, in the County of Norfolk; and for promoting and facilitating an Enclosure intended to be made, of divers Commons, Common Pasture, and Waste Grounds, lying in the said Parish of Great Bircham." Bettesworth to take the Name of Bilson, Bill. With a Bill, intituled, "An Act to enable Thomas Bettesworth Esquire, and his Heirs Male, to take and use the Surname of Bilson, pursuant to the Will of Leonard Bilson Esquire, deceased;" to which they desire the Concurrence of this House. Complaint being made to the House, and Oath made at the Bar, "That James Crocker did, about the Middle of May last, pull or break down certain Sluices or Hatches, near Norris's Mills, in the Manor of Pidletown, in the County of Dorset, belonging to Lord Walpole, or (fn. 1) causing the same to be pulled down; as also of his pulling up or destroying Rowling Bay Sluice, and drawing up a Wear in the Waste of the said Manor, about the Beginning of this Session of Parliament, or causing the said Sluice or Wear to be pulled up or destroyed, in Breach of his Lordship's Privilege, and the Privilege of this House:"
Crocker to be attached, for breaking down sluices. It is Ordered, That the Serjeant at Arms attending this House, his Deputy or Deputies, do forthwith attach the Body of the said James Crocker, and bring him to the Bar of this House, to answer for his said Offence; and this shall be a sufficient Warrant on that Behalf. Frauds in Woollen Manufactures &c. to prevent, Bill. 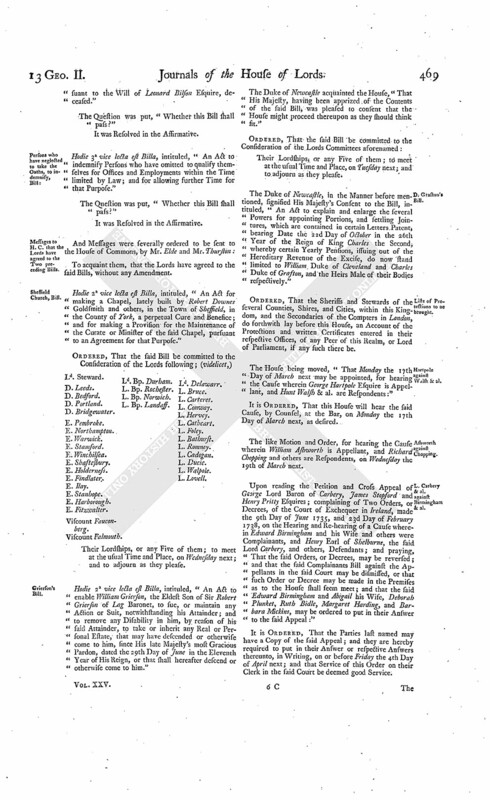 The House (according to Order) was adjourned during Pleasure, and put into a Committee upon the Bill, intituled, "An Act to explain and amend an Act made in the First Year of the Reign of Her late Majesty Queen Anne, intituled, "An Act for the more effectual preventing the Abuses and Frauds of Persons employed in the working up the Woollen, Linen, Fustian, Cotton, and Iron Manufactures of this Kingdom;" and for extending the said Act to the Manufactures of Leather." Commerce with Spain, to prohibit, Bill. 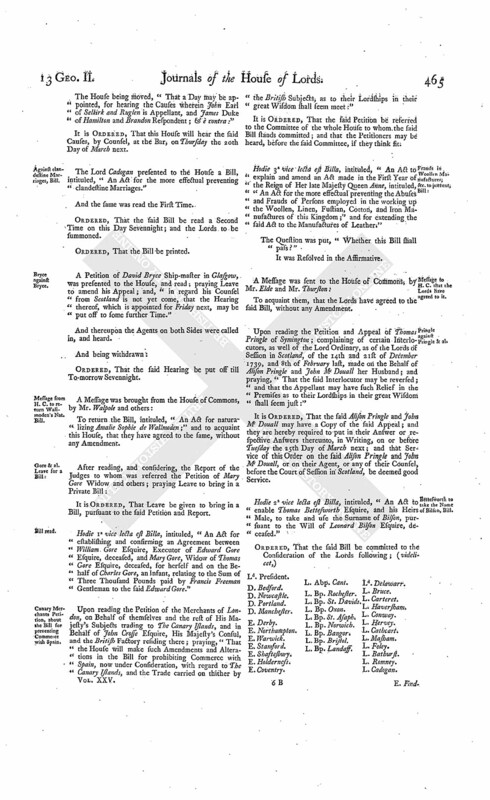 The Order of the Day being read, for the House to be in a Committee on the Bill, intituled, "An Act for prohibiting Commerce with Spain:"
Ordered, That the said Bill be printed; and that the House be put into a Committee thereupon, on Tuesday next; and the Lords to be summoned. Persons who have neglected to take the Oaths, to indemnify, Bill. Hodie 2a vice lecta est Billa, intituled, "An Act to indemnify Persons who have omitted to qualify themselves for Offices and Employments within the Time limited by Law; and for allowing further Time for that Purpose." Ordered, That the said Bill be committed to a Committee of the whole House on Tuesday next. 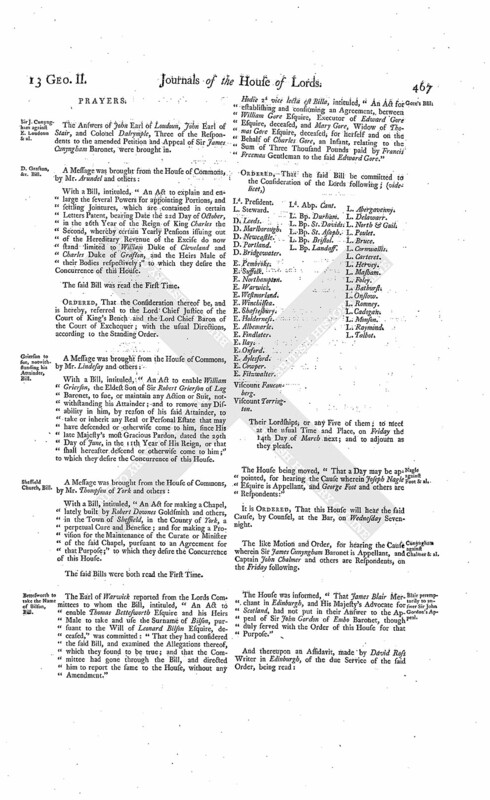 The House being moved, "That the Appeal of His Majesty's Attorney General, presented to this House the 8th of January last, from an Interlocutory Order of the Court of Exchequer, to which Robert Walker is Respondent, may be withdrawn; no Proceeding having been had thereon:"
It is Ordered, That Leave be given to withdraw the said Appeal, as desired. Bryce & al. against Bryce. The House being moved, "That a Day may be appointed, for hearing the Cause wherein Ninian Bryce and others are Appellants, and William Bryce is Respondent:"
Dominus Cancellarius declaravit præsens Parliamentum continuandum esse usque ad & in diem Martis, vicesimum sextum diem instantis Februarii, hora undecima Auroræ, Dominis sic decernentibus. D. of Hamilton against E. Selkirk; & è contra. As was also, the Answer of John Earl of Selkirk and Ruglen, to the Appeal of James Duke of Hamilton and Brandon. The House being moved, "That a Day may be appointed, for hearing the Causes wherein John Earl of Selkirk and Ruglen is Appellant, and James Duke of Hamilton and Brandon Respondent; & è contra:"
It is Ordered, That this House will hear the said Causes, by Counsel, at the Bar, on Thursday the 20th Day of March next. The Lord Cadogan presented to the House a Bill, intituled, "An Act for the more effectual preventing clandestine Marriages." Ordered, That the said Bill be read a Second Time on this Day Sevennight; and the Lords to be summoned. A Petition of David Bryce Ship-master in Glasgow, was presented to the House, and read; praying Leave to amend his Appeal; and, "in regard his Counsel from Scotland is not yet come, that the Hearing thereof, which is appointed for Friday next, may be put off to some further Time." Ordered, That the said Hearing be put off till To-morrow Sevennight. Message from H. C. to return Walimoden's Nat. Bill. To return the Bill, intituled, "An Act for naturalizing Amalie Sophie de Wallmoden;" and to acquaint this House, that they have agreed to the same, without any Amendment. Hodie 1a vice lecta est Billa, intituled, "An Act for establishing and confirming an Agreement between William Gore Esquire, Executor of Edward Gore Esquire, deceased, and Mary Gore, Widow of Thomas Gore Esquire, deceased, for herself and on the Behalf of Charles Gore, an Infant, relating to the Sum of Three Thousand Pounds paid by Francis Freeman Gentleman to the said Edward Gore." Canary Merchants Petition, about the Bill for preventing Commerce with Spain. Upon reading the Petition of the Merchants of London, on Behalf of themselves and the rest of His Majesty's Subjects trading to The Canary Islands, and in Behalf of John Crosse Esquire, His Majesty's Consul, and the British Factory residing there; praying, "That the House will make such Amendments and Alterations in the Bill for prohibiting Commerce with Spain, now under Consideration, with regard to The Canary Islands, and the Trade carried on thither by the British Subjects, as to their Lordships in their great Wisdom shall seem meet:"
It is Ordered, That the said Petition be referred to the Committee of the whole House to whom the said Bill stands committed; and that the Petitioners may be heard, before the said Committee, if they think fit. Hodie 3a vice lecta est Billa, intituled, "An Act to explain and amend an Act made in the First Year of the Reign of Her late Majesty Queen Anne, intituled, "An Act for the more effectual preventing the Abuses and Frauds of Persons employed in the working up the Woollen, Linen, Fustian, Cotton, and Iron Manufactures of this Kingdom;" and for extending the said Act to the Manufactures of Leather." Pringle against Pringle & al. Upon reading the Petition and Appeal of Thomas Pringle of Symington; complaining of certain Interlocutors, as well of the Lord Ordinary, as of the Lords of Session in Scotland, of the 14th and 21st of December 1739, and 8th of February last, made on the Behalf of Alison Pringle and John Mc Douall her Husband; and praying, "That the said Interlocutor may be reversed; and that the Appellant may have such Relief in the Premises as to their Lordships in their great Wisdom shall seem just:"
It is Ordered, That the said Alison Pringle and John Mc Douall may have a Copy of the said Appeal; and they are hereby required to put in their Answer or respective Answers thereunto, in Writing, on or before Tuesday the 25th Day of March next; and that Service of this Order on the said Alison Pringle and John Mc Douall, or on their Agent, or any of their Counsel, before the Court of Session in Scotland, be deemed good Service. Hodie 2a vice lecta est Billa, intituled, "An Act to enable Thomas Bettesworth Esquire, and his Heirs Male, to take and use the Surname of Bilson, pursuant to the Will of Leonard Bilson Esquire, deceased." The House (according to Order) was adjourned during Pleasure, and put into a Committee upon the Bill, intituled, "An Act for prohibiting Commerce with Spain." Ordered, That the House be put into a Committee again thereupon, on Friday next; and the Lords to be summoned. The House (according to Order) was adjourned during Pleasure, and put into a Committee upon the Bill, intituled, "An Act to indemnify Persons who have omitted to qualify themselves for Offices and Employments within the Time limited by Law; and for allowing further Time for that Purpose." Dominus Cancellarius declaravit præsens Parliamentum continuandum esse usque ad & in diem Jovis, vicesimum octavum diem instantis Februarii, hora undecima Auroræ, Dominis sic decernentibus. Sir J. Cunyngham against E. Loudoun & al. The Answers of John Earl of Loudoun, John Earl of Stair, and Colonel Dalrymple, Three of the Respondents to the amended Petition and Appeal of Sir James Cunyngham Baronet, were brought in. With a Bill, intituled, "An Act to explain and enlarge the several Powers for appointing Portions, and settling Jointures, which are contained in certain Letters Patent, bearing Date the 22d Day of October, in the 26th Year of the Reign of King Charles the Second, whereby certain Yearly Pensions issuing out of the Hereditary Revenue of the Excise do now stand limited to William Duke of Cleveland and Charles Duke of Grafton, and the Heirs Male of their Bodies respectively;" to which they desire the Concurrence of this House. Ordered, That the Consideration thereof be, and is hereby, referred to the Lord Chief Justice of the Court of King's Bench and the Lord Chief Baron of the Court of Exchequer; with the usual Directions, according to the Standing Order. Grierson to sue, notwithstanding his Attainder, Bill. With a Bill, intituled, "An Act to enable William Grierson, the Eldest Son of Sir Robert Grierson of Lag Baronet, to sue, or maintain any Action or Suit, notwithstanding his Attainder; and to remove any Disability in him, by reason of his said Attainder, to take or inherit any Real or Personal Estate that may have descended or otherwise come to him, since His late Majesty's most Gracious Pardon, dated the 29th Day of June, in the 11th Year of His Reign, or that shall hereafter descend or otherwise come to him;" to which they desire the Concurrence of this House. 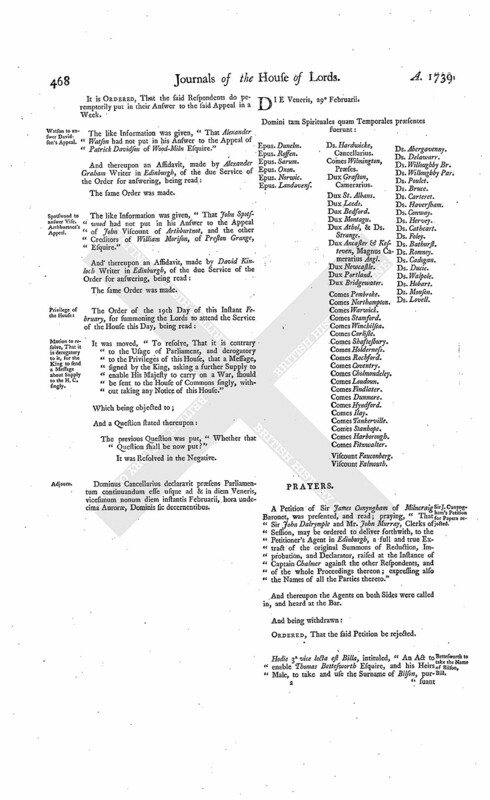 With a Bill, intituled, "An Act for making a Chapel, lately built by Robert Downes Goldsmith and others, in the Town of Sheffield, in the County of York, a perpetual Cure and Benefice; and for making a Provision for the Maintenance of the Curate or Minister of the said Chapel, pursuant to an Agreement for that Purpose;" to which they desire the Concurrence of this House. The Earl of Warwick reported from the Lords Committees to whom the Bill, intituled, "An Act to enable Thomas Bettesworth Esquire and his Heirs Male to take and use the Surname of Bilson, pursuant to the Will of Leonard Bilson Esquire, deceased," was committed: "That they had considered the said Bill, and examined the Allegations thereof, which they found to be true; and that the Committee had gone through the Bill, and directed him to report the same to the House, without any Amendment." Hodie 2a vice lecta est Billa, intituled, "An Act for establishing and confirming an Agreement, between William Gore Esquire, Executor of Edward Gore Esquire, deceased, and Mary Gore, Widow of Thomas Gore Esquire, deceased, for herself and on the Behalf of Charles Gore, an Infant, relating to the Sum of Three Thousand Pounds paid by Francis Freeman Gentleman to the said Edward Gore." Their Lordships, or any Five of them; to meet at the usual Time and Place, on Friday the 14th Day of March next; and to adjourn as they please. Nagle against Foot & al. The House being moved, "That a Day may be appointed, for hearing the Cause wherein Joseph Nagle Esquire is Appellant, and George Foot and others are Respondents:"
It is Ordered, That this House will hear the said Cause, by Counsel, at the Bar, on Wednesday Sevennight. Cunyngham against Chalmer & al. 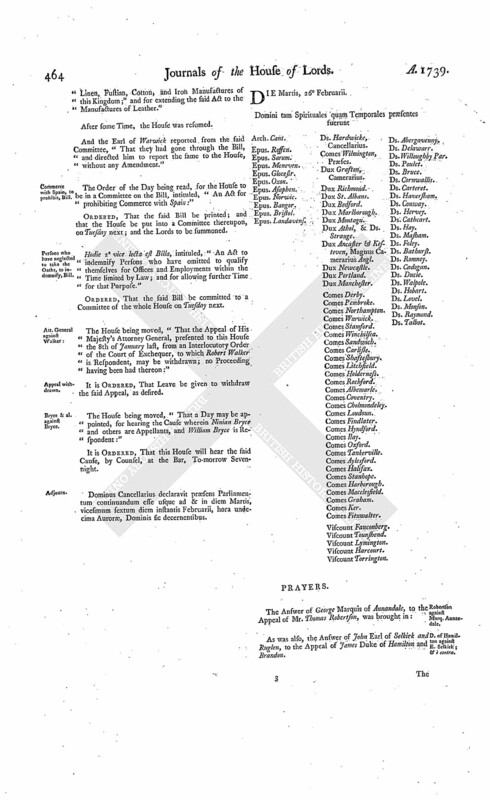 The like Motion and Order, for hearing the Cause wherein Sir James Cunyngham Baronet is Appellant, and Captain John Chalmer and others are Respondents, on the Friday following. Blair peremptorily to answer Sir John Gordon's Appeal. The House was informed, "That James Blair Merchant in Edinburgh, and His Majesty's Advocate for Scotland, had not put in their Answer to the Appeal of Sir John Gordon of Embo Baronet, though duly served with the Order of this House for that Purpose." It is Ordered, That the said Respondents do peremptorily put in their Answer to the said Appeal in a Week. Watson to answer Davidson's Appeal. The like Information was given, "That Alexander Watson had not put in his Answer to the Appeal of Patrick Davidson of Wood-Miln Esquire." The same Order was made. Spotswood to answer Vise. Arthburtnot's Appeal. The like Information was given, "That John Spotswood had not put in his Answer to the Appeal of John Viscount of Arthburtnot, and the other Creditors of William Morison, of Preston Grange, Esquire." Motion to resolve, That it is derogatory to it, for the King to send a Message about Supply to the H. C. singly. 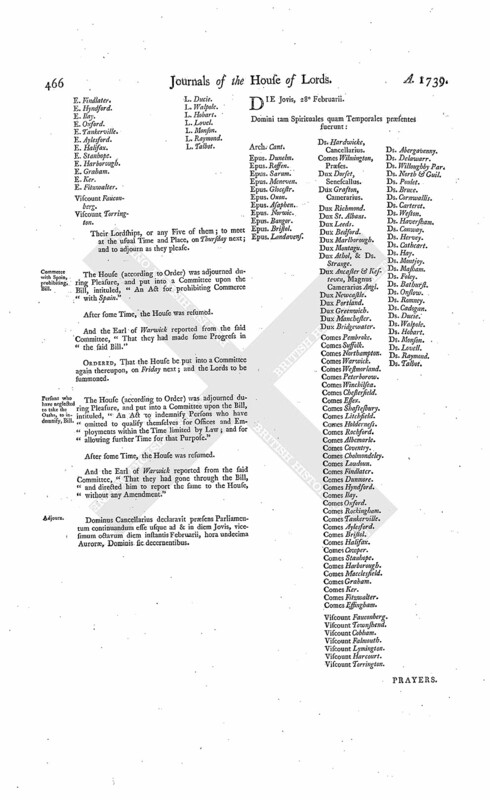 It was moved, "To resolve, That it is contrary to the Usage of Parliament, and derogatory to the Privileges of this House, that a Message, signed by the King, asking a further Supply to enable His Majesty to carry on a War, should be sent to the House of Commons singly, without taking any Notice of this House." Dominus Cancellarius declaravit præsens Parliamentum continuandum esse usque ad & in diem Veneris, vicesimum nonum diem instantis Februarii, hora undecima Auroræ, Dominis sic decernentibus. Sir J. Cunyngham's Petition for Papers rejected. A Petition of Sir James Cunyngham of Milncraig Baronet, was presented, and read; praying, "That Sir John Dalrymple and Mr. John Murray, Clerks of Session, may be ordered to deliver forthwith, to the Petitioner's Agent in Edinburgh, a full and true Extract of the original Summons of Reduction, Improbation, and Declarator, raised at the Instance of Captain Chalmer against the other Respondents, and of the whole Proceedings thereon; expressing also the Names of all the Parties thereto." Hodie 3a vice lecta est Billa, intituled, "An Act to enable Thomas Bettesworth Esquire, and his Heirs Male, to take and use the Surname of Bilson, pur suant to the Will of Leonard Bilson Esquire, deceased." Hodie 2a vice lecta est Billa, intituled, "An Act for making a Chapel, lately built by Robert Downes Goldsmith and others, in the Town of Sheffield, in the County of York, a perpetual Cure and Benefice; and for making a Provision for the Maintenance of the Curate or Minister of the said Chapel, pursuant to an Agreement for that Purpose." Viscount Falmouth. Ld. Bp. Durham. Hodie 2a vice lecta est Billa, intituled, "An Act to enable William Grierson, the Eldest Son of Sir Robert Grierson of Lag Baronet, to sue, or maintain any Action or Suit, notwithstanding his Attainder; and to remove any Disability in him, by reason of his said Attainder, to take or inherit any Real or Personal Estate, that may have descended or otherwise come to him, since His late Majesty's most Gracious Pardon, dated the 29th Day of June in the Eleventh Year of His Reign, or that shall hereafter descend or otherwise come to him." The Duke of Newcastle acquainted the House, "That His Majesty, having been apprized of the Contents of the said Bill, was pleased to consent that the House might proceed thereupon as they should think fit." The Duke of Newcastle, in the Manner before mentioned, signified His Majesty's Consent to the Bill, intituled, "An Act to explain and enlarge the several Powers for appointing Portions, and settling Jointures, which are contained in certain Letters Patent, bearing Date the 22d Day of October in the 26th Year of the Reign of King Charles the Second, whereby certain Yearly Pensions, issuing out of the Hereditary Revenue of the Excise, do now stand limited to William Duke of Cleveland and Charles Duke of Grafton, and the Heirs Male of their Bodies respectively." Lists of Protections to be brought. 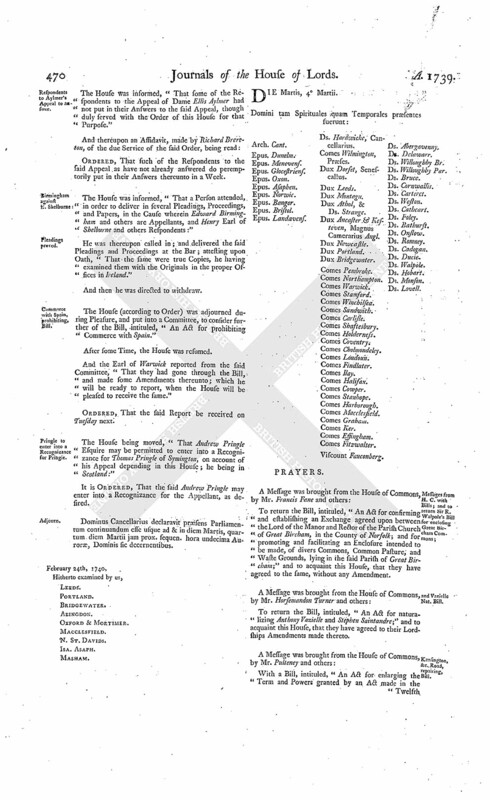 Ordered, That the Sheriffs and Stewards of the several Counties, Shires, and Cities, within this Kingdom, and the Secondaries of the Compters in London, do forthwith lay before this House, an Account of the Protections and written Certificates entered in their respective Offices, of any Peer of this Realm, or Lord of Parliament, if any such there be. The House being moved, "That Monday the 17th Day of March next may be appointed, for hearing the Cause wherein George Hartpole Esquire is Appellant, and Hunt Walsh & al. are Respondents:"
It is Ordered, That this House will hear the said Cause, by Counsel, at the Bar, on Monday the 17th Day of March next, as desired. The like Motion and Order, for hearing the Cause wherein William Ashworth is Appellant, and Richard Chopping and others are Respondents, on Wednesday the 19th of March next. L. Carbery & al. against Birmingham & al. Upon reading the Petition and Cross Appeal of George Lord Baron of Carbery, James Stopford and Henry Pritty Esquires; complaining of Two Orders, or Decrees, of the Court of Exchequer in Ireland, made the 9th Day of June 1735, and 23d Day of February 1738, on the Hearing and Re-hearing of a Cause wherein Edward Birmingham and his Wife and others were Complainants, and Henry Earl of Shelburne, the said Lord Carbery, and others, Defendants; and praying, "That the said Orders, or Decrees, may be reversed; and that the said Complainants Bill against the Appellants in the said Court may be dismissed, or that such Order or Decree may be made in the Premises as to the House shall seem meet; and that the said Edward Birmingham and Abigail his Wife, Deborah Plunket, Ruth Bidle, Margaret Harding, and Barbara Mickins, may be ordered to put in their Answer to the said Appeal:"
It is Ordered, That the Parties last named may have a Copy of the said Appeal; and they are hereby required to put in their Answer or respective Answers thereunto, in Writing, on or before Friday the 4th Day of April next; and that Service of this Order on their Clerk in the said Court be deemed good Service. Respondents to Aylmer's Appeal to answer. The House was informed, "That some of the Respondents to the Appeal of Dame Ellis Aylmer had not put in their Answers to the said Appeal, though duly served with the Order of this House for that Purpose." Ordered, That such of the Respondents to the said Appeal as have not already answered do peremptorily put in their Answers thereunto in a Week. The House was informed, "That a Person attended, in order to deliver in several Pleadings, Proceedings, and Papers, in the Cause wherein Edward Birmingham and others are Appellants, and Henry Earl of Shelburne and others Respondents:"
He was thereupon called in; and delivered the said Pleadings and Proceedings at the Bar; attesting upon Oath, "That the same were true Copies, he having examined them with the Originals in the proper Offices in Ireland." The House (according to Order) was adjourned during Pleasure, and put into a Committee, to consider further of the Bill, intituled, "An Act for prohibiting Commerce with Spain." And the Earl of Warwick reported from the said Committee, "That they had gone through the Bill, and made some Amendments thereunto; which he will be ready to report, when the House will be pleased to receive the same." Ordered, That the said Report be received on Tuesday next. Pringle to enter into a Recognizance for Pringle. The House being moved, "That Andrew Pringle Esquire may be permitted to enter into a Recognizance for Thomas Pringle of Symington, on account of his Appeal depending in this House; he being in Scotland:"
It is Ordered, That the said Andrew Pringle may enter into a Recognizance for the Appellant, as desired. Dominus Cancellarius declaravit præsens Parliamentum continuandum esse usque ad & in diem Martis, quartum diem Martii jam prox. sequen. hora undecima Auroræ, Dominis sic decernentibus.